as I open my eyes!!" Sometime when I was in college my Mum bought me this little book...The ABC of Cookies from the Peter Pauper Press. It is chockful of easy recipes and little rhymes that all have to do with baking. 2/3 cup Flour, sifted with a pinch of salt and 1/2 tsp baking powder. In a bowl mix the sugar with the butter whisking till light.Add the eggs and vanilla and mix well. Melt the chocolate in a double boiler or zap in the microwave. Add to the sugar-egg mix and blend it well. Add the flour gradually mixing as you go and finally stir in the nuts. Mix the batter well. In a greased baking tin spread the batter and bake at 350 F or 180 C for about 25 minutes. Cut into squares and serve hot!! Nice recipe Rhea, and i like the cute nursery rhyme...i love baking really early and filling the house with delicious aromas for the rest of the day!Is this good for an 8 inch or 9 inch tin? yeah, nandita...8 or 9 inch tin should do fine. 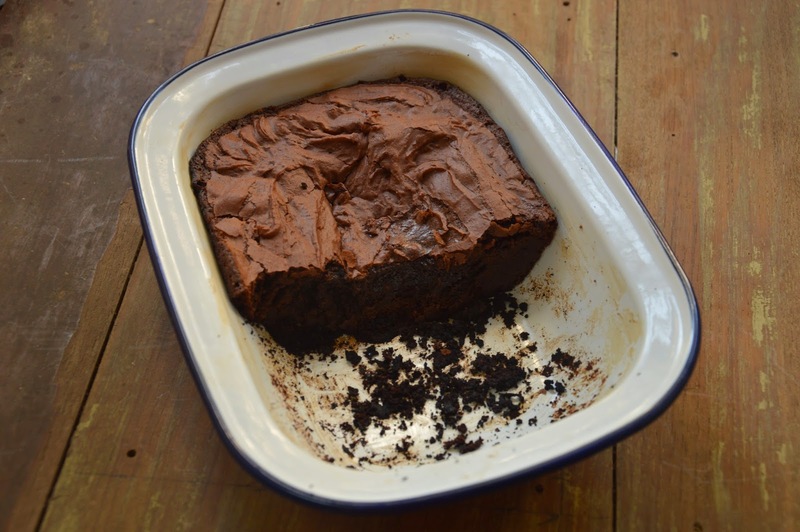 8" will give you thicker brownies!! Simply put chocolate into a microwave safe bowl and zap for a minute. Check if soft enough and zap again 10 seconds at a time if you need to. Lovely recipe ! Can I use flaxseed meal / enerG egg replacer in place of eggs ?